After reading an article from Editor, here at techestigate, about programming for kids and inspiring comment from our reader Ann, “How to get them interested in learning”, I started to think about such a way to start. A lot has changed from late 80`s when I was a teenager. It is hard to explain to my kids how was life back then without mobile/smart phones, tablets, laptops, smart wear etc. My exposure to electronics started with ZX Spectrum and Commodore 64. Later it was HP 28s scientific calculator that got me interested in programming and computer science. Back in 80`s BBC (British Broadcasting Corporation) made BBC Microcomputer System, or BBC Micro, a series of microcomputers and associated peripherals designed and built by the Acorn Computer company for BBC Computer Literacy Project. BBC Micro was designed with an emphasis on education. It was notable for its ruggedness, expandability, and the quality of its operating system. The BBC Micro system was adopted by most schools in the United Kingdom. It was also moderately successful as a home computer in the UK despite its high cost. As a side note, Acorn also employed the machine to simulate and develop the ARM architecture which, many years later, has become hugely successful for embedded systems, including tablets, cellphones and microcontrollers. In 2013 ARM was the most widely used 32-bit instruction set architecture. At the dawn of second millennium new academic discipline called STEM (short for Science, technology, engineering and mathematics) arose. The term is typically used when addressing education policy and curriculum choices in schools to improve competitiveness in science and technology development in an interdisciplinary and applied approach. Rather than teach the four disciplines as separate and discrete subjects, STEM integrates them into a cohesive learning paradigm based on real-world applications. What separates STEM from the traditional science and math education is the blended learning environment and showing students how the scientific method can be applied to everyday life. It teaches students computational thinking and focuses on the real world applications of problem solving. STEM education begins while students are very young, as early as grade 3 (age 9+). Idea is very simple make use of programming as learning tool, learn to program then program to learn. Science, technology, engineering, and math these are all areas of learning that our kids need to be comfortable with to excel in the future. STEM makes creators, thinkers, problem solvers, doers, innovators, and inventors. Exposing kids to simple STEM ideas at an early age today sets a foundation for higher learning tomorrow. So far, we were going over “how to motivate” part of our question. Let me talk a bit about micro bit itself. Again after 30 years, the BBC turn to good old idea, just this time they are calling it BBC Micro Bit. Planning for this project began in 2012 as part of the BBC Computer Literacy Programme and by the time of the launch in July 2015 the BBC had taken on board 29 partners to help with the manufacturing, design, and distribution of the device. The BBC has said that the majority of the development costs were borne by the project partners, and it intends to license the technology as open source and allow it to be manufactured around the world for use in education, and it has formed a non-profit company to oversee this. The Micro Bit was designed to encourage children to get actively involved in writing software for computers and building new things, rather than being consumers of media. The BBC planned to give away the computer free to every year 7 (11- and 12-year old) child in Britain starting from October 2015 (around 1 million devices). In advance of the roll-out an online simulator was made available to help educators prepare, and some teachers were to receive the device in September 2015. Thanks to Cisco conference (and my coworker that has attended it and donated a micro bit) held locally I was able to get Micro Bit. Cisco is one of project supporter along with Microsoft, ARM Holdings, Samsung, Python Software Foundation, Lancaster University and many other. The board’s graphical design is intended to appeal to children and vaguely has the shape of a face (are the push buttons its eyes or the Micro bit logo?) with different silkscreen hairdos of several colors. The board was also designed with safety in mind, which is why it is powered from an external battery pack (two AAA 1.5 V cells) instead of from an on-board button cell as was the case for earlier designs. Power can also be applied through the USB connector. What can be done with it? Besides scrolling text messages and producing other visual effects on the LED matrix the micro bit can be used for many other applications. Because of its battery pack and Bluetooth LE connection the board is an excellent candidate for the Internet of Things (IoT), and wearable and mobile applications. Its on-board sensors allow for orientation and movement detection making it suitable for games and game controllers or remote controls for other devices. 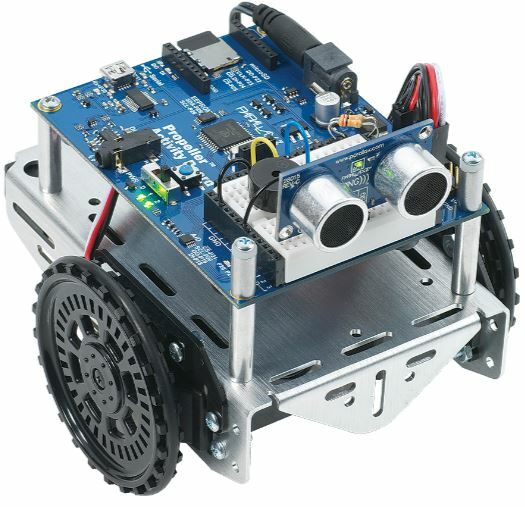 The board can also be used as the brains of an application, like a robot or cart, by using the extension connector. The edge extension connector breaks out 19 GPIO pins of the main MCU (plus power supply), giving access to the pushbuttons, six analogue inputs, a SPI bus and the I²C bus that is also connected to the accelerometer and magnetometer. Furthermore, five pins have been designed as large holes to accept banana plugs and crocodile clips for quick and easy connections to breadboards and other hardware. Projects are available for all of the languages and editors, starting with Block Editor, the simplest, and moving up to MicroPython, which gives you the most versatile interface and the widest range of transferrable programming skills. There’s also a micro bit Android app, although the process of pairing it via Bluetooth is a little frustrating, thanks to some awkward button-pushing gymnastics, six-digit pairing codes and an infuriatingly short window in which to enter them in the app. Rather than having its own coding interface, the app sends you to the website where you can use editing tools you’re already familiar with. For its size, the micro bit is an incredible educational tool that will let teachers, parents and students have fun with code to create games, wearable tech and other devices as yet to be imagined. Its small size and built-in sensors make it quick to code and entertaining to use, but it’s really designed for education and is a springboard to bigger more complex platforms rather than a rival to the likes of Arduino and Raspberry Pi. There is a new and interesting campaign running @ kickstarter regarding creation of the first Arduino based ECU. First of all let`s discuss some things about ECU . What is ECU ? Ecu or engine control unit is something like a brain for your car`s engine. It harvests information from many sensors, and controls many actuators on internal combustion engine, to ensure optimal performance. It does this by comparing data from sensors, with ecu maps or so called lookup tables and adjusting the engine actuators accordingly. So basically ECU is a small and very rough microcontroller with some specialized inputs and outputs, packed in a waterproof casing , with big tolerance for low and high temperatures, and vibrations. Use of the ECU`s in Car industry started in 80s and they started pushing out old mechanical and pneumatic means of controlling systems like air-fuel mixture, ignition timing and idle speed. But enough about ECU itself, there is plenty information to be found all over the Internet. The big thing is that manufacturing of ECUs was reserved for big players like Bosch Electronics, Denso, Delphi, Steyr and some others. Now a new player is coming and it is going to be an open source platform. It will also be developed in few versions, each supporting different features.It is important to know that these days ECUs moved from just controlling internal combustion engines to whole new sets of features and capabilities, like GPS , Wi-Fi , Bluetooth, CAN, GSM and many more. All details about this exciting project can be found on it`s Kickstarter project page . Be aware of a little detail that i noticed regarding this project. 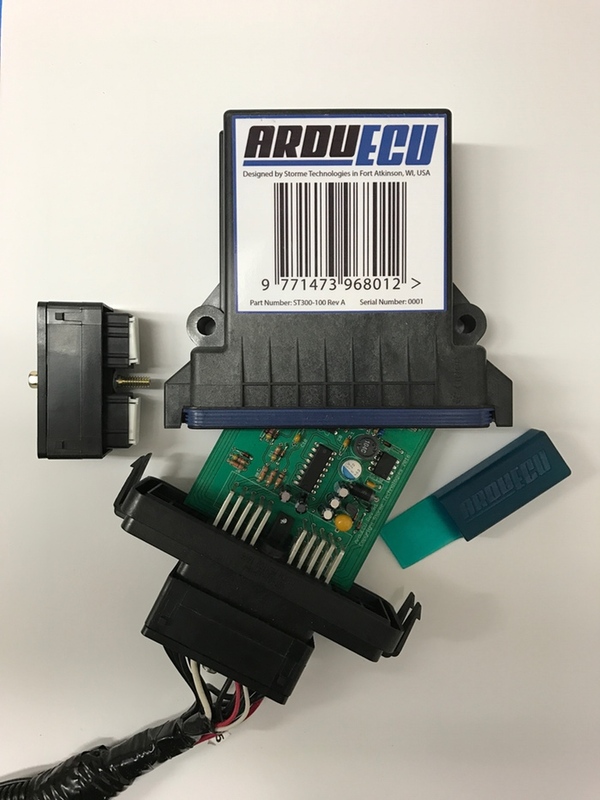 By definition, ECU stands for a Engine Control Unit, and this project has a same three letters, but they stand for Electronic Control Unit, so just stay informed if it could affect your needs. Be sure to support this great project if you can since it will bring the power of ECU (whatever 3 words letters represent) to small manufacturers , hobists, geeks and other weird people that crawl around 🙂 . we would like to share with you some knowledge and experience about home microcontroller playground. Arduino microcontrollers will be in focus. A microcontroller (or MCU, short for micro controller unit) is a small computer (SoC) on a single integrated circuit containing a processor core, memory, and programmable input/output peripherals. Program memory is also often included on chip, as well as a typically small amount of RAM. Microcontrollers are designed for embedded applications, in contrast to the microprocessors used in personal computers or other general purpose applications consisting of various discrete chips. It`s dimensions are around 4.5 x 1.6 cm 1.8″ x 0.62″ and power consumption at 7 V is 20 mA , so small measures make it perfect for small consumption sensitive applications (Weather station that runs on batteries or solar power or something like that) and price of cca 2.5 $ makes it great choice for a small hobby projects. This means that this board is in manufacturing process with two processor types, and depending on that there may be more variations between those two boards (clock speed, amount of memory etc.) If any of this may be important to you watch out what version of board do you buy , since there can be a price difference to. It means that microcontroller works on 5 V (when you connect board to your computer usb port it will get power also and start working) and when you supply it with external power it should be 7-9 V.
This is because this board has its own voltage regulator and it needs some voltage difference to let`s say make it work like it should or to stabilize voltage at 5 V.This is also its logic level. (Remember that with these boards we always talk about DC current). Number of analog Inputs and Outputs, it is number of pins that you can connect analog signal to.In this case it means 8 analog inputs and 0 outputs. Why do we need that some may ask? Let us try to make it as simple as possible, microprocessor works with digital signals, it is it`s advantage , and now we want to process some analog signals , how is that possible? Well MCU has some analog to digital converters built in , sometimes referred to us as ADC, and what they do is convert an analog signal or voltage on a pin to a digital value or a number. By converting from the analog to the digital , we can begin to process analog information’s in our programing and later make some decisions or actions based on these same info. Main parameter of ADC is it`s resolution and it is measured in bits. Generally Arduino ADC is 10 bit , and it means that it can detect 1024 different analog levels it is (210) More bits means better resolution.So if a ADC is 5 V logic level, it means that 5 V on input pin would equal 1023 read value. Or put it in formula Resolution of ADC\system voltage = ADC reading \ analog voltage measured. Logical goal at this moment would be to find ADC reading, and that would be 1023\5 *analog voltage measured. For example if we have 3.4 volts on analog input , digital read would be 1023\5*3.66 and that is 750 . So now you know in this particular case that voltage of 3.66 volts equals 750 digital read signal. So…. what would we need that information? Imagine that you wand to monitor status of a battery, and if it gets to low you want charging to be activated. lets say that this voltage trigger is 3.6 V or as we calculated 750. Now lets make a statement that something called x is 750. To put it in most simple words you would write in your microcontroller program something like this: if x<750 turn on relay 1 . (Let`s imagine that relay1 activates battery charger) .This is just simplified explanation not a coding language, but it is not much more different than that. Now, someone would ask , but what if we want to measure car battery voltage, that should be around 12 V , and in last example we can notice that biggest measuring voltage can be 5 V .Well that would be great observation , but there is a play around it :). It is called voltage divider but we will come to it latter. 14/6 in this case it means that this board has 14 digital inputs or outputs , of which 6 can be PWM outputs. Huh what are you talking about here? Are they inputs or outputs? And what is that PWM??? Ok, lets start one by one…. If it says 16 digital Inputs / outputs it means that every of those pins can be either input or output , digital of course. So how do you make it one or the other way? Lets, presume that we want to connect LED to pin digital 3 on Arduino and to turn it on from time to time , or to make it blink. Simple conclusion is that current will flow from Arduino to LED so Arduino pin is output. So what we did, first of all we said that something that we will call ledPin is on digital pin 3 of Arduino board, and that we said that it is going to be output. Quite cool , isn`t it? We could call it John`sPin or Laker`sPin , or KlingonPin , but we would like to know what is it for , so we should have some naming convention established, but this is enough for now, since we still do not know what is that PWM and what is it for? This is example of how PWM signal would look like on Oscilloscope . But why is it so important , if we would only like to control the brightness of LED i could use a resistors , or a trimmer , it is more simple….. well maybe but what if i would like to control a big DC motor? Answer is PWM is your type of signal :). The example of using PWM for controlling speed and power of DC motor is cordless drill. There you have one small PWM regulator, and more you pres that start button below your finger more speed and power your drill delivers, and if you would put oscilloscope on motor terminals you would see signal like on picture above , going from top when drill is off to bottom as button is fully pressed. The microcontroller has EEPROM (Electrically Erasable Programmable Read-Only Memory) and it is a memory whose values are kept when the board is turned off (like a tiny hard drive). Hm…. you did not read carefully didn`t you? 🙂 Why 1 , and 2 kB ? Of course , two versions of board , two different microcontrollers , and different amount of memory. If you expect to have a memory problems, watch over it (of course who would expect memory problems at the beginning of a project 🙂 ). To put it simple bigger the number = better for you. SRAM (static random access memory) is where the sketch creates and manipulates variables when it runs.Again , bigger the sketch = more memory to keep it running . Intruder alert: .. what is sketch? Sketch is basically Arduino program. It is a peace of code that is uploaded to , and run on Arduino board. These days it has a .ino extension, and is produced by Arduino IDE. Again two different boards issue…. Flash memory (program space), is memory space where the Arduino sketch is stored. More memory = better for you = bigger sketch can be stored. Type of USB connector on board. The native serial support happens via a piece of hardware (built into the chip) called a UART (Universal asynchronous receiver/transmitter). This hardware allows the Atmega chip to receive serial communication even while working on other tasks. So basically it is a hardware serial port.This particular board has only one , and you may want to keep those two pins free, or you may end up with problem uploading sketch to a board or using serial monitor.There is also software serial, and for some applications it can be used, but generally baud rate should be kept low (9600) or errors may appear. It`s dimensions are around 7 x 5.5 cm or 2.7″ x 2.2″ and power consumption at 7 V is 20 mA 50 mA @ 7V and it`s price is about 4 $. We often say around since there are many different versions of the same board and this information is just for you to get the idea of sizes. This board is most common beginners choice, great for many projects, very well documented, many examples, many Shields . Here is a picture of Arduino Uno with Ethernet shield plugged on top. Ethernet shield as it would sound logical gives networking capabilities to Arduino. For example you could run web server on your arduino, and post some data on it, or even make it so that you can turn on / off some relays thru web page, or transmit some sensor readings to services like thingspeak, or dweet.io . It`s dimensions are around 10.2 x 5.5 cm or 4″ x 2.1″ . Power consumption when running code is still unknown but will be tested and published soon. Price of cca 15 $ makes it a little more expensive, but hey it is one of the most powerful Arduinos in these days, so maybe it`s worth considering it as choice for your next project. There is one more very important thing to consider about DUE: It`s logic level is 3.3 V so take care, if it`s gonna “talk” with some other devices , make sure that they are also at 3.3 Volts ll or you may end up with burned or at least damaged Arduino. Same goes for sensors, shields etc. . On the other hand you can mitigate that problem by using logic level converters, but that is other story, for now let`s try to keep things as simple as possible. But wait, did we few sentences before, just mention sensors ? What about sensors? What kind of sensors? Well that is the beauty , all kind of sensors are there for MCU`s and especially Arduino…. Let`s first observe DUE`s specs, and then we will return to the sensor story. If we compare it to Uno we see dramatic increase in everything , CPU speed , nobler of both analog and digital inputs, some analog outputs, more ram and flash , more UART`s , and of course it is not 5 but 3.3 volts logic level. This particular board is real small little IOPS (inputs-outputs) monster. It can interconnect with whole bunch of sensors, relays, and other things , and it has a juice to process them. Great board for almost any kind of project, but keep in mind that it is 3.3 V operating voltage. Now back to sensors , lets make it a little more imaginable, what sensors are , and what they do…. A sensor is a device that detects and responds to some type of input from the physical environment. The specific input could be light, heat, motion, moisture, pressure, voltage, current, sound, weight, or any one of a great number of other environmental phenomena. Some sensors are only able to detect change, but some are able to even measure that change very precise. This sensor is able to detect flammable and combustible gasses like Methane, Butane, LPG and smoke.May be great for home fire/gas warning/alarm system. Price is about 1.5 $. This sensor is able to detect Carbon Monoxide, so in combination with MQ-2 you get a great early warning gas detection system. Price of MQ-7 is about 1.6 $. It comes in two forms, or packages: TO-92 casing (not waterproof , good for measuring air temperature) on left picture, and Etanche or Waterproof casing , on the right picture. These sensors are easy to use , connect and read. Multiple sensors can be connected on same input, since they each have hardware address burned in.If you are gonna use few sensors, like 2 or 3 and have enough inputs free on your MCU, use separate input pin for every dallas sensor , it is easier, since you do not have to read hardware addresses of sensors, and then target them to read data. Waterproof version is great for measuring temperature of liquids, and other thing and places where to-92 would be impractical or on the harms way.It can be connected to MCU with 2 or 3 wires, both ways work well, and less wires means more simple and practical, so take your pick. Price of DS18B20 is less than 1 $ for TO-92 version , and about 4 $ for waterproof version. temperature measurement error: +-2 degrees. Great for hobby weather station projects. It`s successor is DHT22 better range and more precise. Price of DHT11 these days is about 1 $. Name of this sensor says enough. Why would we use it? Well, with this sensor stuck in ground, MCU could “know” was or is there a rain, and how dry or wet is soil, and based of that turn on or off irrigation system. Price of this sensor is below 1 $. Motion detection sensor, great add for home made alarm system. Price of this sensor is around 1 $. This sensor can measure distance in range of 2 – 500 cm by precision of 3 millimeters.Great add on for diy robots or smart cars. Price of this sensor is around 1.2 $. Monitor your mains voltage, for example you can make MCU to send a signal for generator to start if voltage goes below or above nominal value. Price of this sensor is around 5 $. This sensor can identify the presence or absence of sound, based of that your MCU can make some actions, for example if there is a sound detected, turn on light. This sensor can detect light intensity. Based of this information your MCU can activate something else, for example if it is a daytime do not turn on watering system. This sensor is used to trigger at the effect of various vibration, theft alarm, intelligent car, earthquake alarm, motorcycle alarm, etc. There are many many different types of sensors (light, sound, distance, voltage, motion, vibration, gas, temperature, moisture and many, many more). Sensors are quite inexpensive . Combination of different sensors can give your MCU interesting possibilities , and decision making information. So sensors are great, and they can make our MCU playground even bigger and more interesting and productive. This is maybe most common used and best money\features ratio Arduino board. It`s dimensions are same as DUE board or around 10.2 x 5.5 cm or 4″ x 2.1″. Power consumption when running code is still unknown but will be tested and published soon. With price about 8$ whole bunch of In`s and out`s and descent memory and clock speed it is great for many applications and there is even an open source 3D printer driven by MEGA. If we compare it to DUE , it has almost same number of ports, slower processor and less memory, but it is a 5V board, so if you are gonna deal with 5V signals , chose this one.There are also different versions of this board, so less money does not necessary mean that you got a better deal. This is applied for all MCU boards, since there is big difference in quality from components used to soldering. There is also whole mess about different markings, but for the most part it is marketing trick. You have Arduino Mega ADK (stand for Android development kit) , then you have Arduino Mega 2560 but for the most part those are the same boards. Now let`s observe some non Arduino boards…. Two different versions, version 01 on the left and version 07 on the right. The ESP8266 is a low-cost Wi-Fi chip with full TCP/IP stack and microcontroller capability produced by Shanghai-based Chinese manufacturer, Espressif. But what makes it so interesting? It has a Wi-Fi , but is also a microcontroller. So what? So you can use it in different ways, for example it can work as Wi-Fi interface for other MCU (like Arduino). In this case it will transmit some data that other MCU gives it, over serial connection thru Wi-Fi to LAN or to Internet. It can also host a web server and present data to it.But i think that that was not in mind of designers od 8266. It is quite equipped to work as standalone MCU. General-purpose input/output (GPIO) is a generic pin on an integrated circuit whose behavior—including whether it is an input or output pin—is controllable by the user at run time. GPIO pins have no predefined purpose, and go unused by default. It is something like Arduino in`s and out`s. This little piece made entire revolution on IoT playground, and we will not even try to go deep in to a story about ESP8266 since there is so much blog posts, guides, instructables , even whole blogs dedicated to it. Thing is if you are gonna start playing with ESP , than you will soon learn what the hell is 🙂 . Why? But that is not all, you have also a different command processors, for them. In original version they come with AT cp (those of you that remember dial-up times will know AT commands ), but there are also NodeMCU some others. We will soon write more details about ESP, to get you started…. Well, it is time to end this story, I hope you find it useful, interesting, and if you have any comments, thoughts, or simply want me to test something , please leave a comment and we will get in touch.